Readers know how affectionate and enamored I am of flickr but the feelings are just as gooey for ecto, the desktop blog editing tool for Mac OSX and Windows. In fact, it is one of the very few software titles out there that I shelled out some shareware $ for. Without a doubt, I would blog less and use less media if I was forced to use the web editing interfaces. I use ecto to edit about 8 different weblogs, mostly MovableType, but I have also successfully tested it for a Blogger hosted site. It has way too many features to gush on about, but the HTML shortcuts are a godsend, the previews save me from a large number of embarrassing typos (not all of them ;-), the new image and media uploading/attachingg by drag and drop in version 2 of ecto are just a gem and a half. 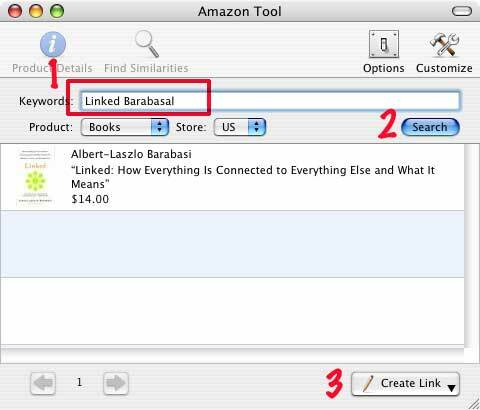 And there are little things I find by accident, such as the Amazon search I just used in a previous post — a keyword search tool that can help me build a link to relevant books and other things available from Amazon without ever having to visit Amazon or use my web browser. For that last post, where I wanted to reference a book, (1) I merely entered the title (and author’s last name since the title search would not be specific); (2) clicked search; and (3) highlighted the result and clicked “insert link”. Not only does ecto build a proper link to the book’s page at Amazon, it inserts an icon of the book cover into my blog post.